The Fire TV Stick joins other TV-on-a-stick offerings such as Google Chromecast, the Roku Streaming Stick and scores of obscure products powered by Google Android or various Linux distributions. In a nutshell, TV sticks are a convenient way to pipe online video content to your big-screen TV screen, instead of gathering the family around a laptop or tablet with a small screen and tinny speakers. The stick plugs into your TV's HDMI port, and connects via wifi to your Internet service. All TV-on-a-stick products are miniaturized computers with an operating system, applications such as streaming video players, and pre-programmed Internet connections to Hulu, Netflix, Amazon Instant Video, Youtube, and many other online streaming video services. Built-in apps enable management of your favorite channels, shows, schedules, and interactions with other home entertainment devices. Bundled content sources: Can you get HBO, Netflix, Youtube, NBC Sports, the Ukrainian national TV station, etc? The mix of bundled sources is the hottest field of competition among TV sticks. Ease of use: Can you control the stick with a remote, a smartphone app, on your big-screen TV, and via a Web browser on a desktop or laptop? The more “yes” answers to these questions, the better. Of course, it also matters whether the controls are simple, intuitive, and minimize hand motions. And forget buffering; no one wants to watch a spinning circle. Price: The Roku stick retails for $50; Chromecast goes for $35. Amazon is launching the Fire TV Stick at $39. The Fire Stick scores very well on the essentials. Its dual-core 1 GHz processor addresses 8 GB of flash memory – 4 times that of Chromecast and 32x the Roku stick’s RAM. It includes a VideoCore 4 GPU for lightning-quick rendering of 1080p HD signals, plus Dolby Digital Plus 7.1 surround-sound. ASAP (Advanced Streaming And Prediction) tech minimizes buffering by caching and pre-fetching your favorite content before you request it. Beware: This is one of those product categories where it’s easy to get ripped off and better to stick to well-known brands. See my article, Free Satellite TV On PC? to learn about scammy software that's sometimes bundled on USB sticks and dishonetly sold as a replacement for satellite or cable TV service. Over 200,000 movies and TV episodes are available, millions of songs, and hundreds of games. Movies can be rented for just 99 cents. If you have more than one TV, you can easily move the Fire TV Stick from one HDTV to another. Amazon says the ability to use the Fire TV Stick in hotels, college dorms or a friend's house is coming soon. A dedicated handheld remote control and a smartphone app provide optimal access to the Fire Stick’s functions. And voice search “that actually works,” according to Amazon, helps you locate shows or genres by just speaking to your Fire Stick. Everything can be displayed everywhere. If you’re watching a YouTube video on a tablet you can mirror it to your wide-screen TV, and vice versa. No need to miss a football play during bathroom breaks, just grab your tab and run. You can also use X-Ray on your tablet or smartphone while watching a show to pull info from IMDb (Internet Movie database) about the characters, trivia, music, and more. Most recent comments on "NEW: Amazon's Fire TV Stick"
I was one of those crazies who pre-ordered the Fire Stick! Because, as a current Prime member, I could pre-order it for $19.00. Now, that's a deal I just couldn't pass! One of the things that Amazon's Fire TV Stick obviously can do is show Amazon instant video. Google's Chromecast can only do that by showing it on a laptop using the Chrome browser and then casting it. That doesn't work very well. I may go for the Fire TV Stick and see how it works. EDITOR'S NOTE: That's a really good reason for buying the Fire TV stick. On the flip side, I'll bet the Fire stick doesn't play very nice with Google Play Movies. I would like to see a comparison of all of these types of streaming media sticks. I have a ROKU, and I love it. I can't imagine an improvement on it. I cut the cable TV, put up an HD antenna for local channels, and cut my entertainment bill in half. I like the concept of paying just for those channels I actually watch [Netflix, etc.]. If there is something better than ROKU, I would like to read about it. It's hard to beat. I'm also a current Prime member and couldn't pass up the $19 price. Delivery is supposed to be Nov 26. One more toy for me! lol It would beat dragging my blu-ray or laptop around for streaming on other TVs if it works. If it doesn't work, it won't take up much room in my junk box. Looking forward to your review if you get one, Bob! Just a warning not to make the mistake I made. About a year ago I got a Chromecast. Plugged it in, connected it to my network, then didn't do anything with it until a few days later when some friends came over and I wanted to show them how it worked. Spent the next few minutes frantically looking all over my living room for the remote. It was a real Homer Simpson DOH! moment. I'm an Amazon Prime member. Where can i get the $19 deal for the Amazon Fire TV Stick? Will this work with my DVD player on my computer? One vital feature I use on my WD Live box is streaming content on my computer to my tv via "network share" (videos, music, photos, etc.) feature. Can the Firestick (or any other 'stick' ) also do this? While, all of this, sounds good ... I guess, I am old fashioned. I want my DirecTV, it's a simple as that. Now, I do have a Netgear streaming adapter, for my TV in my Living Room. Hubby doesn't want anything to do with "smart" anything, okay? I belong to VUDU, which is a FREE streaming service, but, you do pay for the movies or shows, you want. I have NO problem with that, either. I can easily watch, the movies that I purchased for $5 or less, full length and in HD, if, I want to pay a bit more. So, for now, I have them in SD, because I purchased them for my computer, which doesn't have HD capabilities, so SD is what worked. I have a Samsung smart tv and a Amazon Prime subscription. 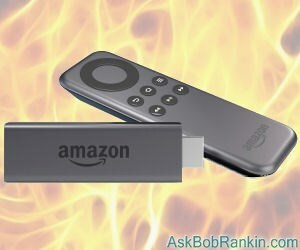 Is there any advantage to the Fire TV Stick. My DL speed stinks so the spinning circle is a big problem. Advice appreciated by this dum ole guy! Guess I will hold off now that my Prime membership won't help out and see how the reviews go. Besides the delivery date is now January 15th. How fast download speed is needed to use these devices? Would I have to upgrade from 1.5 mps? EDITOR'S NOTE: For reference, Netflix recommends 1.5 Mb/sec as a minimum; 3.0 for SD quality; 5.0 for HD quality. Thanks for the info, I bought it after reading your post and love it. I did follow this simple video to side load Firefox in to it and now i have full access even when staying in hotels. This makes it 100% better for travelers. I have Direct TV and I'm techinically challanged. How does the Fire Stick work? Does the Direct TV box over ride the Fire stick's ability to connect to the internet? The Fire stick works great, especially compared to Chromecast's stick. The only draw backthat I encountered is that it pushes Amazon's movies and sales. Voice activation goes to only prime movies ignoring Netflix or other feeds. These sticks work off the HDMI slot that they are plugged into just like your CD player. You have to change your TV setting to the HDMI feed that your stick is connected on. HDMI1, HDMI2 ect. CAN THE FIRE TV STICK RUN WITH AWIRE057 ROUTER? EDITOR'S NOTE : is there something special or odd about that router? I'm not sure why it would be dependent on the particular brand of router you have. I want to display to my Sony smart TV a movie I watch from Popcorn Time on my laptop with windows 8.1 (Upgraded from 8.) It seems Amazon fire TV stick does not show on TV directly from laptop like it does from Android tablet. However it supports Miracast. Windows 8.1 projects to a wireless display using Miracast. On my windows 8.1 I tried to setup, devices, project but it does not show "add wireless display" option I do not know why. Can anyone help? The apartment I now live in does not allow me to have Direct tv due to satellite dish unable to point in direction needed. Direct tv says I can use direct tv.com. I do not have a "smart tv"n however I do use Amazon fire stick with prime. Dtv did not know if stick is compatible to stream the Dtv. Can it work? I have DirecTV and just purchased Amazon Fire Stick. It works occasionally, but is constantly losing the signal stating "broadband connection too slow." I have no problem with other devices - one desktop computer, one laptop, and kindle. Could it be my router? Please help since I am technically challenged by this. Thanks!